Dakila Artist Collective President and pop culture icon, Lourd de Veyra, once said, “The worst load of bull ever said about cinema is that it can change society.” For the human rights film festival, Active Vista, organized by Dakila, the same holds true. Active Vista with the support of the Royal Norwegian Embassy, Movies that Matter, The Asia Foundation and AusAID, announced last June 12 the winners of its ALAB Short Filmmaking Grant: 13 filmmakers, 13 human rights issues, 13 priority agenda for 2013. “We have no illusion that a human rights film festival like Active Vista can change society. Even Lino Brocka’s Orapronobis failed to stop human rights violations after EDSA,” said Noel Cabangon, musician-activist and Vice President of Dakila. “But we do aspire to spark some change by daring filmmakers and advocates to get out of their comfort zones to make films that grab you by the collar, make you see the reality that surrounds you and move you into action. By granting 13 filmmakers the opportunity to wield their vision into a reality, Active Vista hopes to at the very least make a dent by challenging its audiences to change the way they look at things with hope that maybe the things they look at may eventually change. Perhaps, one viewer at a time,” he added. Out of 130 applicants, 57 were selected to undergo a rigorous training on advocacy filmmaking conducted by some of the country’s top caliber film industry practitioners such as premiere documentary filmmaker, Ditsi Carolino; multi-awarded director Raymond Red; scriptwriting guru, Bing Lao; topnotch independent filmmakers Francis Pasion and Sherad Sanchez; and avant-garde film producer Raymond Lee. From the 57, only 13 were selected to receive short film production grants to produce their films based on their advocacies. The ensemble includes students Ron Segismundo of DLSU- College of St. Benilde (Children’s Rights), Rowena Sanchez of UP Diliman (Right to Basic Social Services), Richard Coronel of APFI (EJKs, Torture and Enforced Disappearances), John Gonzales of UE (Human Trafficking) and Nica Santiago of FEU (Right to Health); freelance editor Che Villanueva (Right to Freedom of Expression), animator Zara Terrado (Environment and Climate Change); Lanao Barangay Councilor and MSU Marawi Student Hidaya Macarandas (Peace); Philippine Deaf Resource Center founder and executive director Dr. Liza Martinez (PWDs); recent awardee of the Jeonju International Film Festival for his full length film Ex Press, Jet Leyco (Peace); Cinema One Originals My Paranormal Romance director Victor Villanueva (PWDs); and Muslim Transgender and STRAP member Brigitte Salvatore (Gender Rights). The 13 short films are set to premiere in August 2012 and will be screened in 20 cities nationwide during the Active Vista Film Festival run. Winners of the top prizes shall be awarded during the Festival Closing on December 2012. “The interesting blend of young filmmakers and seasoned human rights advocates in the ensemble whose fresh takes and innovative approaches to advocacy films contribute greatly into mainstreaming human rights into the consciousness of the Filipino public. The 13 issues tackled in these short films are the priority issues that our Government needs to address especially now that our nation is set to elect a new batch of leaders in 2013,” Velasco further explained. 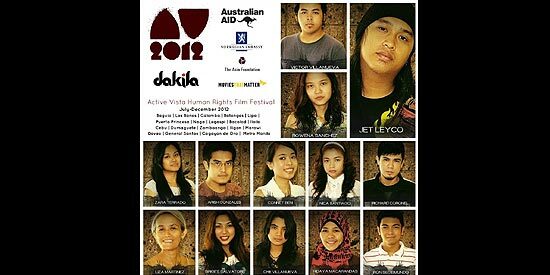 Active Vista Human Rights Film Festival will open in July 2012 at Metro Manila, travel to 20 different cities in the Philippines and culminate with the main festival in December. For more information about the Active Vista Film Festival, contact Dakila at 0917-5057055.